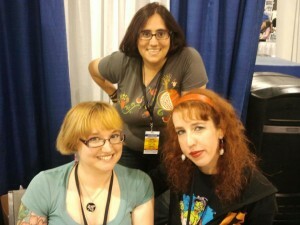 Left to right: Rachel Pandich, Vanessa Satone and me at the Womanthology table at Heroes Con. 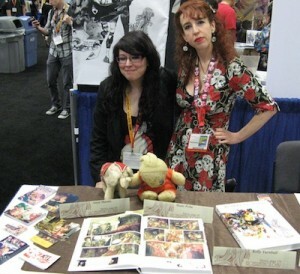 As I get ready to leave for San Diego Comic Con and finally meet Mado, my artist and co-conspirator on “A Stuffed Bunny in Doll-Land,” I thought a good way to start my first author blog could be with some photos from past Womanthology signings. Heroes Con in Charlotte, NC was a solid trial run. 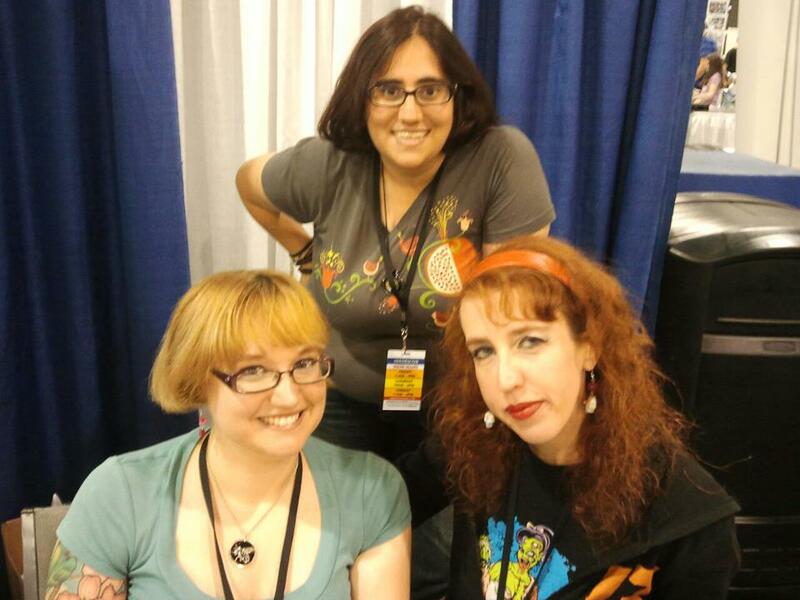 It was the first time I had a chance to meet and hang out with a large group of Womanthology: Heroic creators. About a dozen were there including the fabulous Rachel Pandich, who has been doing a fine task organizing all our con appearances and store signing; my dear friend and amazing artist Janet Lee; Wasted Minds artist Vanessa Satone, whom I had the pleasure of rooming with; Stephanie Bucsema, who rocked a wardrobe of vintage dresses to still my ATLRetro heart; several of the youngest contributors including the four Ladd sisters and Grace Miner (age 7 when she drew Paula Pansy and now 9!) and many more. 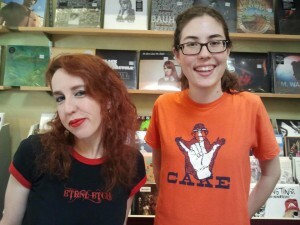 Me and Blue Deliquanti at Criminal Records on Free Comic Book Day 2012. But what really was awe-inspiring and fun was the enthusiasm of the fans who dropped by the Womanthology table in Artists Alley, not to mention the fact that the Womanthology panel was packed to standing room only and latecomers had to be turned away because we’d filled the room to capacity! And yes, the rumors are true – Heroes Con re-defines creator-friendly, and I have to admit I could spend hours slowly wandering Artists Alley and exploring the wide range of talented artists in today’s comics. 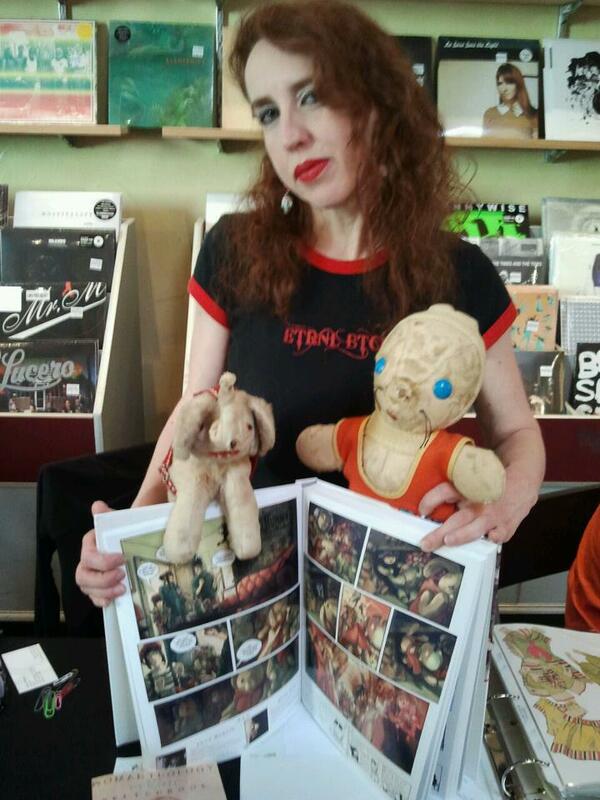 With Munny and Elephant at Criminal Records. My first comic book store signing was at Criminal Records in Atlanta on Free Comic Book Day on May 5 with fellow Atlanta-based artist, Blue Deliquanti. 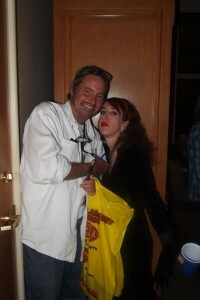 Here’s a photo of me and Blue. As at Heroes Con, many people stopped and admired Womanthology: Heroic and we sold and signed more than a few copies, too. 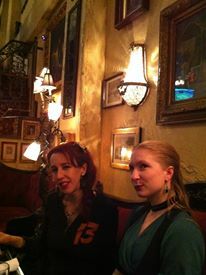 The best part was meeting several little girls who were aspiring writers and artists. That’s really at the heart of what Womanthology is all about – inspiring young women to pursue a career in comics and know it’s not a boys’ club any more. It was also cool to be signing on my home turf in Atlanta, see lots of friends who came out to support me, and sell a few ATLRetro T-shirts as well. Of course, Munny and Elephant insisted on coming along, too.